2. In case I find out only when I'm at the medical that they also need info from my Italian records can they simply access them themselves or do I have to provide them (translated) afterwards therefore causing delays in my visa process? 3. I put NO on the question that asks "Have you ever had any kidney or liver disease" as it was only a single episode, nothing chronic. Is that correct? UPDATE: I'm getting some answers to the above also HERE and HERE. Working backwards: Kidney stones are a form of kidney disease (https://www.kidney.org/blog/ask-doctor/having-kidney-stones-considered-having-kidney-disease) so you should answer yes. If the doctor needs something from your medical records that you did not bring, they will unlikely be able to access them directly and it can cause delays in the visa application. The applicant must show his/her passport (or other photo identification) and appointment letter to the doctor during the medical examination. and does not mention medical records anywhere. 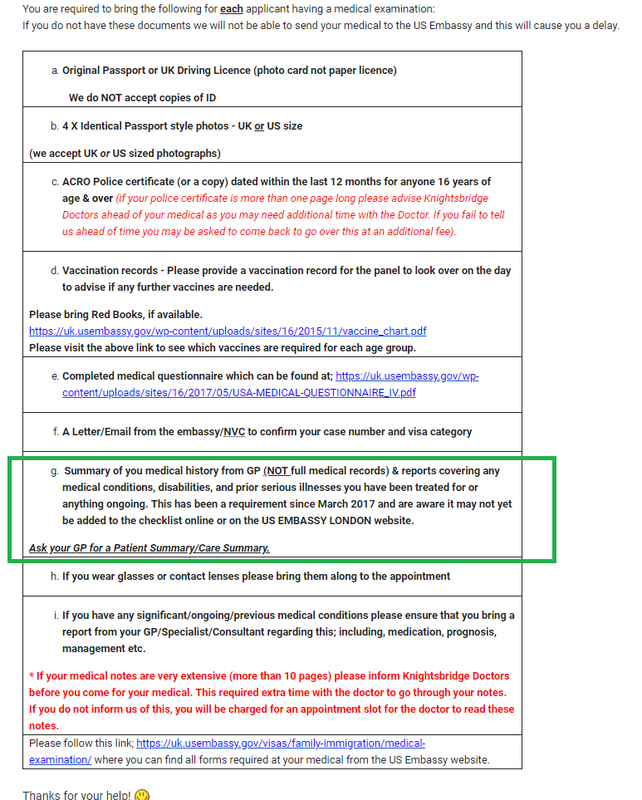 The only mention of records, apart from immunization records, that I can find is in the London Embassy instructions which says to bring records regarding TB treatment. There are no instructions at all about translating medical records. My personal strategy would be to bring what I have and not stress about it. Medical examination passed. I put YES as you suggested for kidney illnesses.